Sir Thomas Beecham's second of four scheduled live concert broadcasts with ABC's "Blue Network Symphony Orchestra" must have given the new station's controllers any number of headaches, primarily because of the sudden death in office of President Roosevelt two days before the concert, scheduled to coincide with the funeral service at the White House. We do not know what music Beecham had planned for that concert, but one assumes it would have been considerably different to the more solemn affair delivered on the day. In preparing this previously-unreleased broadcast for issue I've had to make several unusual interventions. The broadcast began with a minute's silence, which I've faded. A section of about 50 seconds of music was missing from the Sibelius - this I've patched in from another recording which I've "aged" to match the Beecham. A much shorter section in the Schubert had to be similarly patched. The latter, interrupted by the broadcaster for a live report from the White House (audio of which doesn't apparently survive) is quite literally unfinished - but we have most of it. Thereafter the concert is complete, though the announcement of a Berlioz Intermezzo and Serenade lead into a faded-in Tchaikovsky Elegie, indicating that the concert, before a largely silent audience, continued without a break. It's a remarkably historic document with some fabulous playing. Sound quality again is good AM radio; I've been able to deal largely with some interference from other radio stations, whilst some disc surface noise is occasionally audible. SCHUBERT Symphony No. 8 in B minor, D.759 "Unfinished"
The second in the series of Blue Network concerts in New York on 14 April 1945 (see Volume 1 for further details) saw a tribute concert in memory of President Roosevelt who had died just two days before. The programme had to be changed to reflect the sombre nature of the occasion which was interrupted for a funeral report from the White House. A few salient details need to be borne in mind. After the introduction by Milton Cross there was a minute’s silence – one can hear cross-station interference – that producer Andrew Rose has wisely truncated. 50 seconds of music is missing from the Sibelius, which he has patched from another recording – he doesn’t say which. A shorter patch was necessary in the Schubert which is ended early in any case by a live report. Almost everything here is familiar from Beecham’s extant discography, though not everything will be familiar from on-the-wing live performances such as these. Siegfried’s Funeral March starts slightly awkwardly and ensemble is less blended than in his 1953 RPO studio performance. Nevertheless, the cumulative charge of the music-making is very strong indeed. Something should be said about Pristine’s tracking details which list track 3 as The Death of Mélisande from Sibelius’s Op.46 suite. In fact, there are, to be precise, three movements from the suite; Mélisande (No.2), Pastorale (No.5) and finally, and most appropriately, The Death of Mélisande itself. This offers a more wide-ranging mini-suite in which playful arabesques lighten the commemorative and grieving elements enshrined in the bulk of Beecham’s programme. His 1955 RPO performance may be more tightly played but this New York one has great gravity – his vocal exhortations during this last tableau will be familiar to those who know his similarly live BBC Second Symphony recording. The inclusion of the Adagio from Mozart’s Divertimento in D, K131, is apt. The surface hiss level is at its most intrusive in the second movement of Schubert’s Unfinished. But the brass is trenchant and the strings taut and memories will stir of his pre-war reading with the LPO just as much as the 1951 RPO. By a quirk of reportage therefore, given that the concert relay is halted before the end of the work, we have a doubly-unfinished symphony. The real bonus for Beecham aficionados is the inclusion of Tchaikovsky’s Elegie from the Serenade for Strings, which he never recorded commercially. Milton Cross announces this as Berlioz’s Intermezzo and Serenade, a clue perhaps to the original concert line-up. This is a tremendous reading - fluctuating, brimming, teeming with ardent lyricism, and a fulsome example of Beecham’s art. The concert ends with the Marche Troyenne - a noble way in which to end this near-hour long salute to the departed leader. This sequence of continuing discs leads me to hope that aural evidence has survived of Beecham’s coast-to-coast tour of the US with the RPO in 1950. 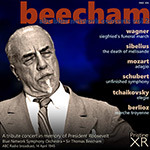 A national moment of silence precedes the broadcast concert of the Blue Network Orchestra led by Sir Thomas Beecham – the 14 April 1945 concert coincides with the funeral service for President Franklin Delano Roosevelt – and the program Beecham leads reflects the spirit of valediction. The famous Siegfried Funeral March from The Twilight of the Gods receives a potent, albeit direct, realization from Beecham’s responsive players, a linear approach we might ascribe to Toscanini. Even more pathos-ridden, the English horn solo and strings that constitute the first section of The Death of Melisande (1905) makes a lachrymose impression that remains special, even in the extensive Beecham canon of Sibelius. After a relatively genial, nostalgic middle section, the return of the somber strings leaves us emotionally drained. The Adagio from Mozart’s second divertimento for strings, that in D Major, K.131, adds a distinct element of old-world grace to the occasion. The diaphanous strings trills assume a hue, an intimation of mortality. The second period in the music, with its sudden ff, expresses a level of otherwise understated anguish in musical moment that approaches Handel for exquisite, melodic fervor. The major work, Schubert’s Unfinished Symphony, assumes an air of guarded mystery and often aggressive fire in the opening Allegro moderato. Beecham subdues the brass parts to allow the famous string melody resonant primacy. But this music of solace breaks off and enters an abysmal realm of profound grief which Beecham invests with demonic power. We sense that, had Beecham the benefit of sound enhanced beyond the monaural resources of AM radio, the effect would have been truly overpowering. The E Major Andante con moto communicates a poignant dignity, solemnly martial, enhanced by the colors from the clarinet, oboe, French horn, and distant tympani. An announcement interrupts the broadcast of this movement; then the music resumes – having missed the Delius component – with the heart-rending, diaphanous Elegie from Tchaikovsky’s C Major Serenade for Strings, a work Beecham never committed to commercial issue. The program concludes on a more stoical note – the Trojan March of Berlioz – and even the spoken introduction by Milton Cross conveys an air of uplifted resolve.